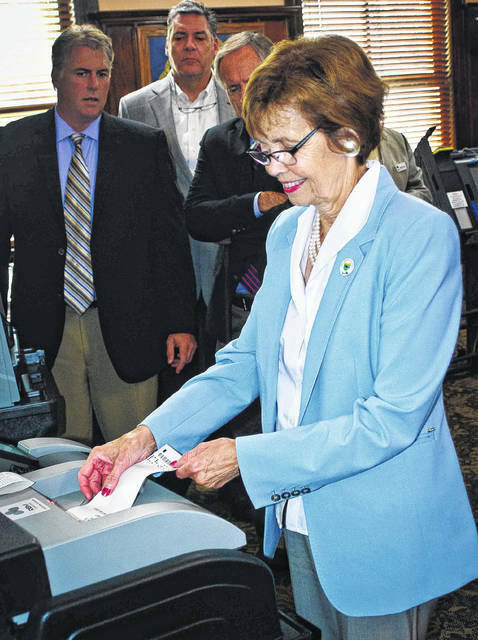 The Delaware County Board of Commissioners received a hands-on demonstration of the Unisyn Voting Solutions OpenElect voting system in September. The Board of Elections, along with RBM Consulting, LLC, set up the equipment in the commissioners’ hearing room for a functionality demonstration of the system. After Commissioner Barb Lewis cast a ballot, she walked over to feed it into the tabulation machine so it could be recorded with all the others ballots cast that day. In Thursday’s (Dec. 6) meeting of the Delaware County Board of Commissioners, the Unisyn Voting Solutions OpenElect voting system was adopted on the recommendation of the county Board of Elections for use during elections in Delaware County. The Delaware County Board of Elections also recommended the vendor RBM Consulting, LLC for the purchase and service of the equipment. Watkins said the staff of the Board of Elections was diligent in making sure the new equipment met all the statutes and regulations of the State of Ohio. The Delaware County Board of Elections received word from the Ohio Secretary of State’s Office in February 2017 that a directive would be issued to all county board of elections to replace the voting machines in all 88 counties to more secure machines. However, a year before the directive was announced, the Delaware County Board of Elections began conversations with the Delaware County Board of Commissioners about replacing the county’s voting machines. According to Karla Herron, Board of Elections director, an order will be placed for “a little over 900 machines,” but Anthony Saadey, Board of Elections assistant director, said it would be closer to 1,000 machines. Watkins said the voting system is a hybrid that uses a select touchscreen that creates a voter-verified paper trail by producing a paper ballot that voters can verify after voting. Once the ballot is confirmed, it’s fed into a tabulation machine where the information is recorded onto a thumb drive along with an image of the actual ballot. In June, the 132nd Ohio General Assembly passed Senate Bill 135, sponsored by state Sen. Frank LaRose (R-Hudson). The bill affords the secretary of state the authority to request up to a total of $114.5 million in state funds for reimbursement to county boards for the purchase of voting machines. The bill went into effect Oct. 29. “Obviously, we would prefer the state to be a higher contributor, but we do have to make sure that our residents have the best equipment possible that gives them the best chance to have an accurate vote in our county,” said Commissioner Gary Merrell. “No county in the state does it better than we do it,” he added, directing all the credit to Herron, Saadey and the Board of Elections staff. According to Board of Elections records, there are 143,441 registered voters in Delaware County. The Board of Elections current machine total is 719, and those machines were purchased in 2005 with federal funding that flowed down to the counties from the state. During elections, the county Board of Elections staffs and supports 153 percents.